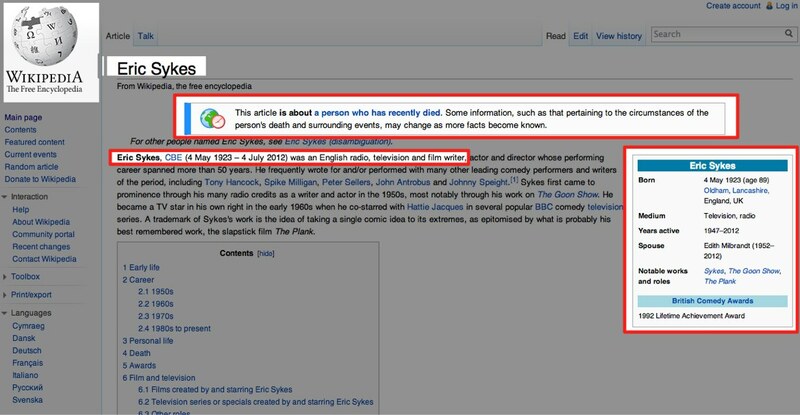 Today Eric Sykes died. For many outside of the UK that won’t mean a lot. 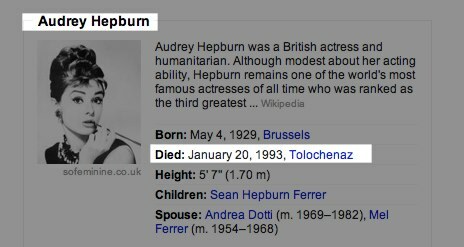 For those in the UK it means that an illustrious figure passed away. As always events like this however also tell us a lot about the world we live in. The online world now gives us instant insights in how we respond to events like this. It shows how engaged we are or not and it also shows how quickly some online players can respond. We saw for example that Google’s newest feature, direct answers, is not as quickly up to date as some others are. The first thing people these days usually look at when something like this happens is Twitter. Is it trending yes or no? 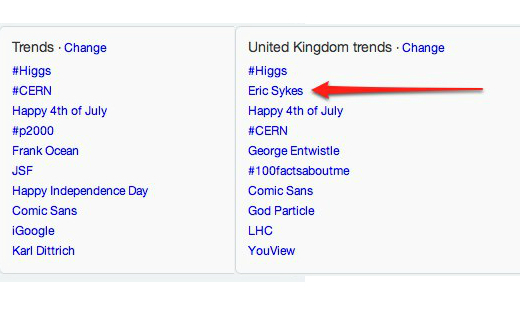 Twitter.com doesn’t give us Eric Sykes as trending, that makes sense because it is set to world wide and in the US it’s the fourth of July, so nothing much else happening there. Do we change the trending view to the UK however Sykes does show up. Finally Google. We know Google always wants to be first to the game. But were they? Looking at Google.co.uk we are seeing a familiar picture: Google News has been ‘upgraded’ to the top of the results showing the latest news on his death, with the BBC link right there again. So far so good. But as you might know Google has launched a new feature on the Google.com properties: direct answers. 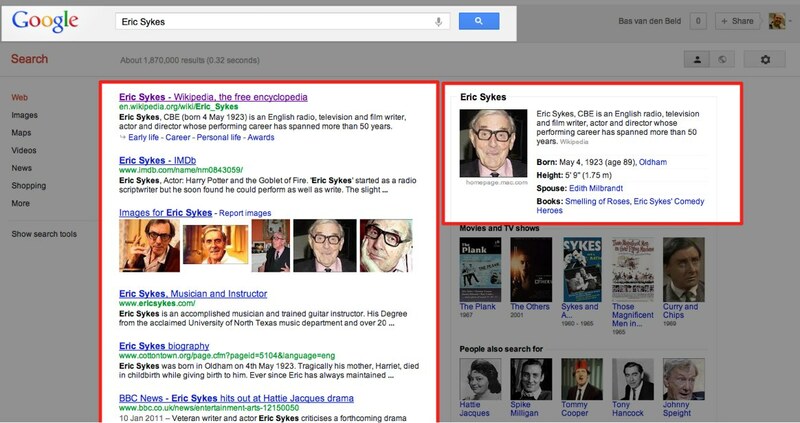 It should gives us instant information on our search, and a search like “Eric Sykes” is one which should and does trigger direct answers. 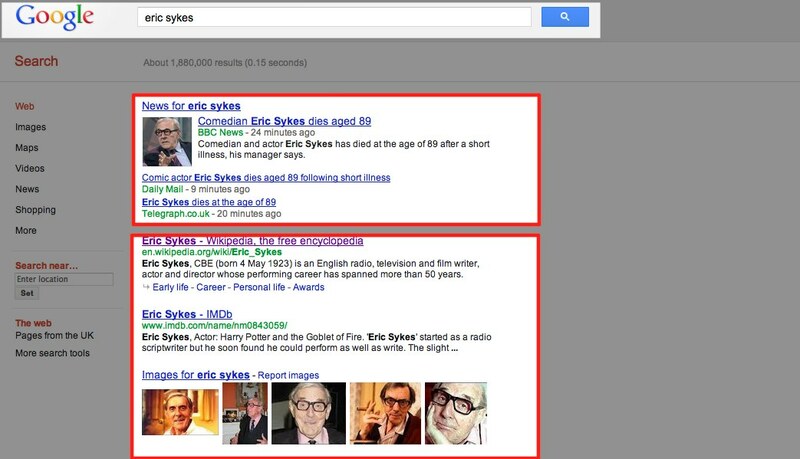 It doesn’t show anywhere in this search that Sykes has just died. Not in the right pane, no news is promoted, nothing. So what we can conclude is that direct answers are not as direct as they should be. Maybe because Google is getting the information from specific sources the data isn’t updated yet. But with the fact that Google News isn’t triggered here (mind you, that could be location based, and it was triggered in later searches) there is no way of knowing Sykes died based on just this search. And that is a search from right after the news came out. Twitter still wins it when it comes to getting the news quickly. Somehow that doesn’t seem to be what Google was intending with it I think.